Traditionally they are deep fried before serving, creating a crisp pastry roll. Spring roll pastry wrappers are wafer thin, made from a thin batter of flour, cornflour, water and salt, so when they are deep-fried they don’t crack. The trickiest aspect of making spring rolls is probably the rolling technique, which can take a bit of practice to master. Judging the quantity of filling is also important, as overfilling can cause the rolls to burst during frying. But before making your spring rolls, you will need a suitable filling. Fortunately, the options are practically endless - from cabbage to coriander, mouli to mangetout, a wide variety of ingredients can be used. 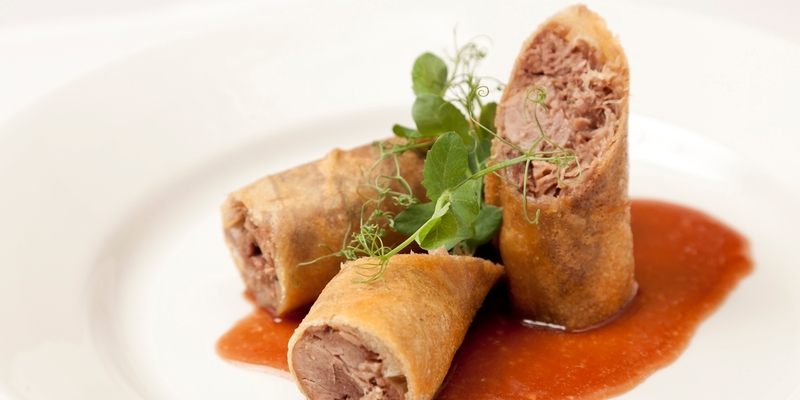 If you're looking for a meaty spring roll, try Andy Waters' recipe for Crispy duck spring rolls and Adam Stokes' Rabbit spring rolls recipe. Seafood and fish ingredients also work well. Spring rolls can be accompanied with a range of dipping sauces, but sweet chilli, hoisin or barbecue are often favoured. Place the wrapper with one of the points facing towards you, making a diamond shape. Cover the wrappers not in use with a damp cloth to prevent them from drying out. Fold the lowest corner over the filling to encase the mixture. Next, fold in the two side corners running vertically from the filling, then tightly roll from the bottom to the top. Make sure that there are no air holes in the roll, as this can allow the oil to enter the filling. Instead of deep-frying spring rolls, you can cook them in the oven at 200°C/gas mark 6 for around 20 - 25 minutes until golden. Before cooking, the outside of the roll should be glazed with an egg wash to ensure it crisps up. The fillings often reflect the local region, with herbs and spices used depending on local availability. Contemporary fillings have included anything from shredded duck, braised rabbit or paneer, courgette and sweetcorn. As long as the filling isn’t too wet, there’s no reason why you can’t experiment with different fillings and flavour combinations.